The "LC" is now only a week away. Over the past few weeks I've been playing with various transmitters and receivers to decide which I'm going to use. 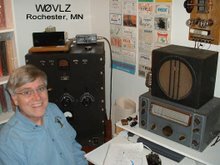 Two that I've been working with are a Push-Pull 6L6 transmitter and my version of the 1941 Beginner's Receiver. This evening I put this pair on 40 mtrs and had a nice QSO with K2UPI in Bridgeport, NY. The signal reports were 569 both ways. This receiver and transmitter worked well together. I'll certainly use them during the LC. Next I'll make certain my HRO Sr and Utah Jr are working well so that I can use them also, probably on 80. Addendum, 1/11/2016. This evening I worked Jerry, W1ZB, in Andover, MA on 80 using the HRO Sr and Utah Jr at 15 watts... I'm ready to LC.